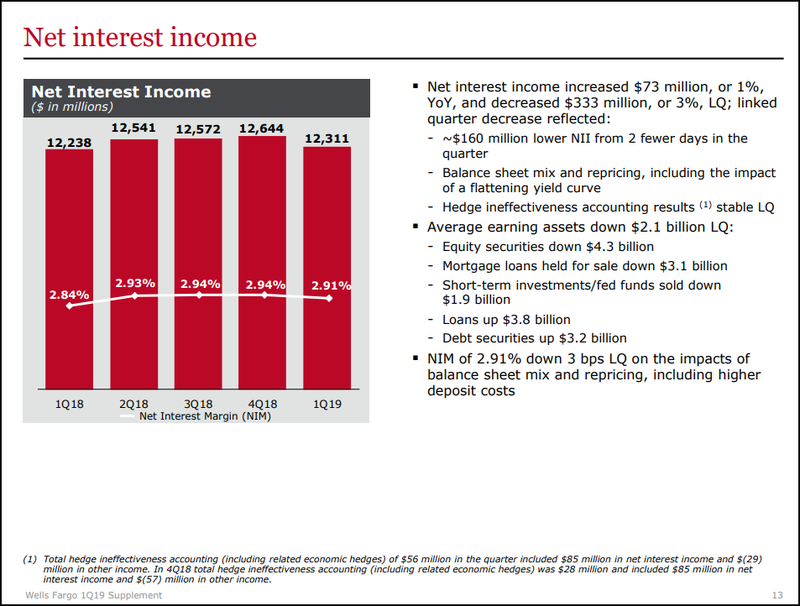 Net interest income fell $333MM Q/Q. Net interest margins declined 3 bps to 2.91% Q/Q. WFC CFO sees NII possibly down 2-5%. Last year, I reported NII growth would move from deceleration to contraction in 2019. Last October, I wrote an article on Wells Fargo (WFC) that outlined some of the problematic trends in the banking industry as a whole. The biggest problem that I saw at major banks was that the cost of funding was rising faster than interest income. I said that this was a structural issue and that not only would this not reverse, but it would also get worse in 2019 as net interest income (NII) growth would go negative. 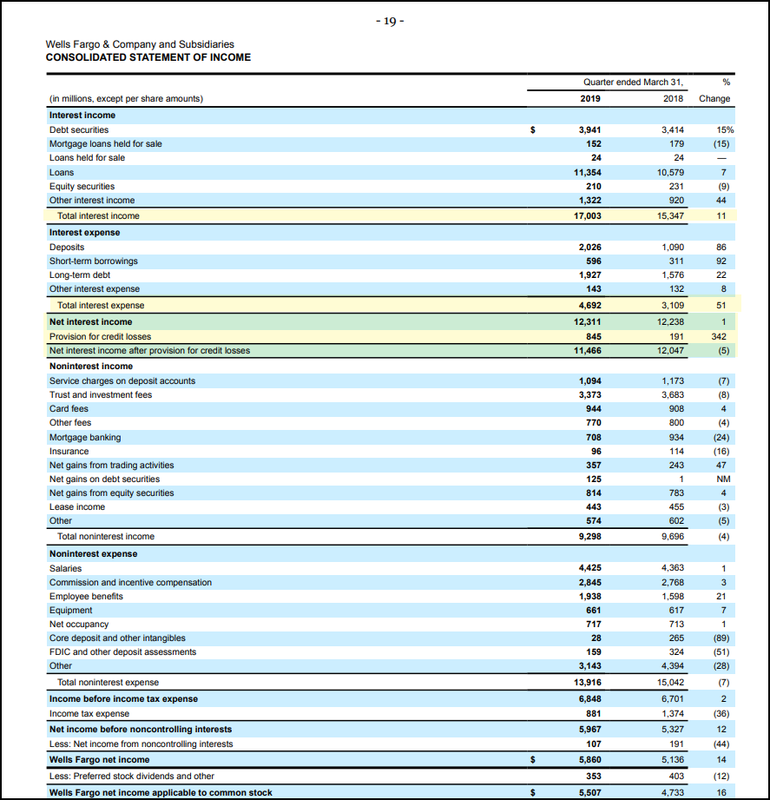 In October, in an article on the banks that I wrote here, I forecast declining net interest margins (NIMs) and negative net interest income growth in 2019, a trend that no analysts at the time had pointed out. Fast forward to today's results from WFC and we can see that NII fell by $333 million quarter over quarter, and on the conference call, the CFO guided that NII could be down 2-5%, a trend that we saw last year. While I am not short any major bank, only regional banks through KRE since May 2018, the trends across the industry do not lend themselves to profitable equity holdings as XLF has been flat since late 2017 and KRE has been flat since late 2016. Let's dive into the numbers at WFC to understand why these trends that we saw developing last year, ahead of consensus, are going to get worse. 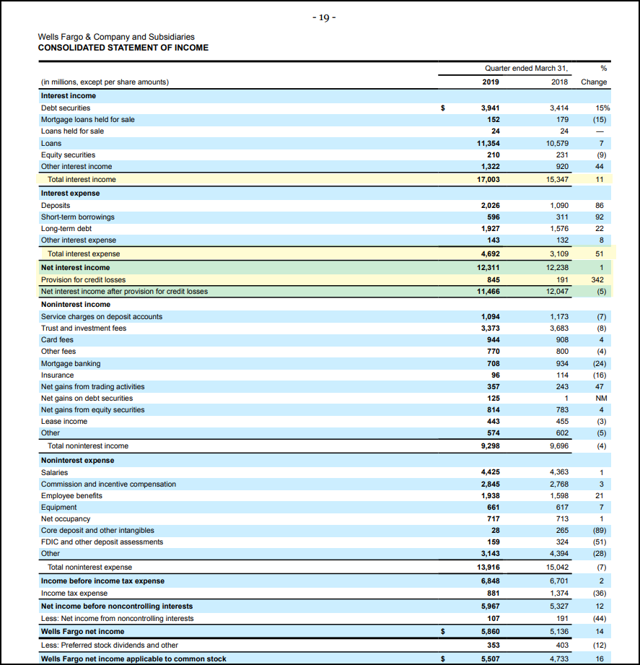 NII at WFC fell $333MM quarter over quarter, but increased 1% year over year. NIMs compressed by 3 basis points from 2.94% last quarter to 2.91% this quarter. The industry trend that is not unique to WFC is the cost of funding that is soaring relative to interest income. As the consolidated statement of income at WFC shows, total interest income increased 11% year over year, while total interest expense surged 51% year over year. As a result, as indicated above, before credit provisions, NII only increased 1% year over year. After credit provisions, NII declined by 5% year over year. This trend is not unique to WFC. All banks are seeing the cost of funding rise faster than interest income, and last year, I forecast that this trend would get to the point that we would see NII and NIM compression. While we are not seeing this at all the major banks yet, by the end of 2019, NIM compression will be seen across the industry on average. There is a regime change in the banking sector. After the Fed started to raise interest rates and the yield curve started to compress, the year-over-year change in NII started to deteriorate. 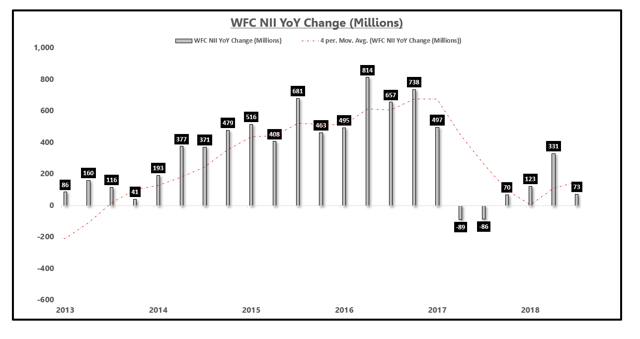 Below is a chart of the year-over-year change in NII at WFC and the massive drop-off after 2016 can be seen clearly. The reason that I have been profitably short regional banks and not large money center banks is due to the fact that large banks have more diversified businesses and can offset these trends better than some of the smaller regional banks that are more dependent on lending margins. This trend is difficult for the banking sector to overcome, and that is why there has been a massive underperformance in this space as a whole. We could dive into the loan segment at WFC or other banks, but the trend I want to focus on is what I said would happen last year, which is NIM and NII compression. The cost of funding at banks will continue to rise, and if the yield curve stays this flat, interest income will not be able to keep up. With the OIS spread inverted, the Fed is on hold in terms of raising rates, which is not going to be helpful, and if we do in fact see any front-end interest rate cuts due to the inverted curve, NII and NIMs will be adversely impacted even more. NIM expansion is under pressure, and across the industry, by the end of the year, we are likely to see NIM and NII compression, which is likely to be absorbed a bit better at the major banks relative to the regional banks, but it is not a favorable trend for the industry as a whole. Banks saw NII growth expand through 2016, and that trend is reversing, which explains the underperformance since the Fed started to aggressively tighten monetary policy. There is a lot to discuss in regards to bank earnings, more than is possible to be covered in this short article, so I don't want to give an overly reductionist viewpoint of a complicated industry. With that being said, from a macro standpoint, the compression in NII from funding costs outpacing interest income is a trend that will plague WFC and all banks in the quarters ahead and is something to monitor closely. According to the CFO, funding costs are still going to rise, and without an upward move in long-end rates, NIMs are going to be under pressure. EPB Macro Research uses composite leading indicators and a wide range of economic data to properly prepare for inflection points in the economic cycle. The most opportunity and the largest changes in asset prices occur during positive and negative economic cycle inflection points. The consensus is consistently offsides at major turning points. Learn where the economic cycle is going and what that means for your portfolio with a no-risk 14-day free trial of EPB Macro Research. Disclosure: I am/we are short KRE. I wrote this article myself, and it expresses my own opinions. I am not receiving compensation for it (other than from Seeking Alpha). I have no business relationship with any company whose stock is mentioned in this article.